The University of Delaware’s Alfred Lerner College of Business and Economics welcomed 18 students into the trust management minor, the first of its kind at any accredited business school, during the fall semester of 2017. This fulfilled the long-term vision defined by a unique collaboration between UD, the Delaware Bankers Association (DBA) and the Delaware Financial and Educational Alliance (DFEA). Delaware’s trust industry is robust with more than 43 established companies, one of the most prominent jurisdictions nationwide for both substantive trust laws and the tax treatment of trusts. The industry’s growth rate has skyrocketed over the past decade to the point that firms could not acquire enough knowledgeable talent to meet demand for services. The DBA and DFEA, with backing from the industry, approached the Lerner College in 2014 to help create the trust minor as an innovative solution to this workforce gap. Brown Brothers Harriman Trust Company of Delaware, N.A. Young Conaway Stargatt & Taylor, LLP. As the major outcome of this collaboration, the minor in trust management focuses on trusts, wills, estate planning and taxation, providing students the unique opportunity to learn from industry experts one-on-one through mentorships and internships. The program also offers students a more diversified skillset and a clear path to employment prospects when they enter into varying facets of the financial sector after graduation. The program is well underway at meeting its goals, as each trust management minor student will complete an internship with a financial institution prior to graduating. Approximately one quarter of the Delaware trust companies are participating so far in the internship program. Each of the 18 students is also paired with a mentor, whom they meet with once a month through the entirety of their time in the program. This provides substantial and meaningful contact between mentor and mentee in the hopes that the relationship grows over time. 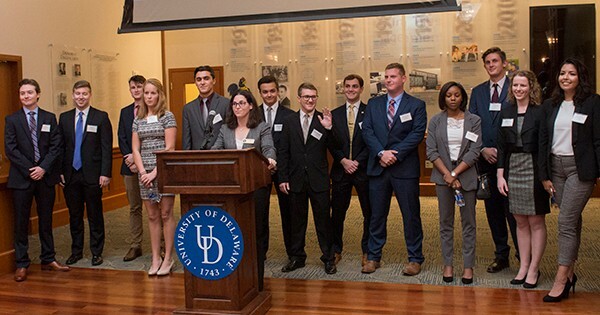 Students said that they see the trust management minor as an opportunity to expand their knowledge in the financial industry and their career options for after graduation from UD. Junior financial planning and wealth management major Brittany Harrison said that she joined the minor to learn about a part of the industry that was foreign to her. Members of the community including representatives from the founding companies celebrated with members of the Lerner College in mid-fall at a launch event. Jennifer McCloskey, director and instructor of the trust management minor, has been instrumental in its success. “I am humbled by the fact that [UD has] given me the opportunity and the gift of coming to work each day to do what I love, to make a difference, to inspire, to educate and to influence young lives,” McCloskey said. Every student currently in the minor attended the launch event and spoke very highly of McCloskey both in and outside of the classroom.